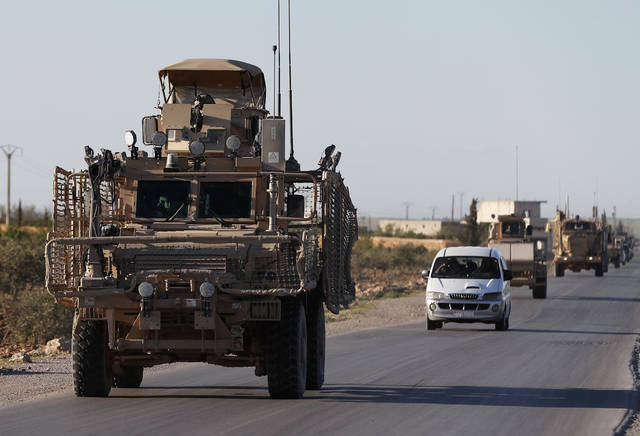 BAGHDAD (AP) — After days of conflicting statements about a timeline for U.S. President Donald Trump’s decision to pull out American troops from Syria, a U.S. military official said Friday that the withdrawal process has begun, declining to comment on specific timetables or movements. Col. Sean Ryan, spokesman for the U.S.-led coalition fighting the Islamic State group, said “the process of our deliberate withdrawal from Syria” has started. “Out of concern for operational security, we will not discuss specific timelines, locations or troops movements,” the Baghdad-based official said in a statement emailed to The Associated Press. 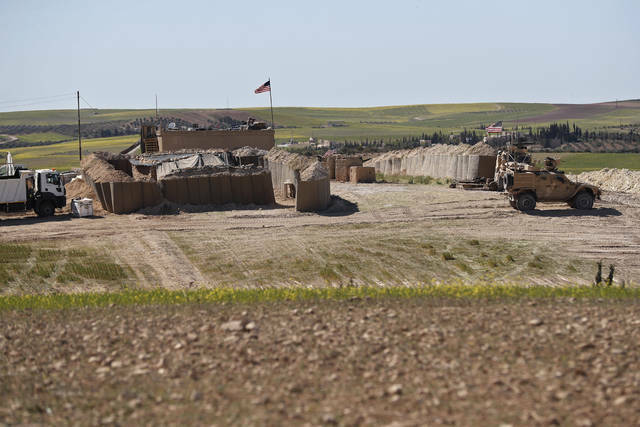 Confirmation of the first withdrawals comes amid confusion over plans to implement Trump’s pullout order and threats from Turkey to attack the Kurds, who have been America’s partners on the ground in the war against the Islamic State group in Syria. 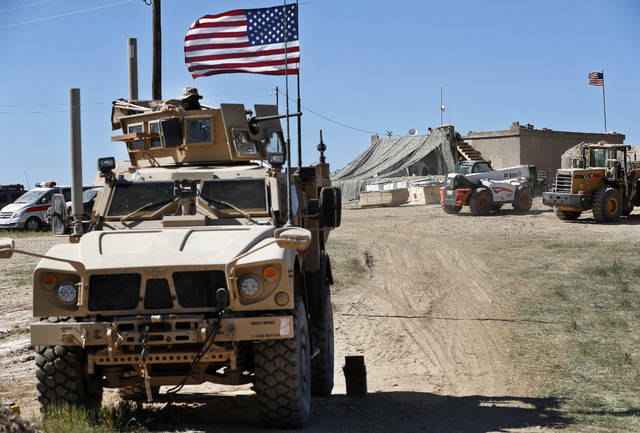 On Sunday, U.S. national security adviser John Bolton said American troops will not leave northeastern Syria until IS is defeated and American-allied Kurdish fighters are protected, signaling a slow-down in Trump’s initial order for a rapid withdrawal. Secretary of State Mike Pompeo, who is on a tour of the region, has also sought to reassure the Kurds that they will be safe after U.S. troops withdraw from the country. CAIRO (AP) — U.S. Secretary of State Mike Pompeo brought the Trump administration’s anti-Iran message to Gulf Arab states on Friday, arriving in Bahrain to continue a nine-nation tour of the Middle East aimed at reassuring America’s partners that withdrawing troops from Syria does not mean Washington is abandoning the region. In Bahrain, the UAE and later Qatar, Saudi Arabia, Oman and Kuwait, Pompeo will also be making the case as he did on previous stops in Jordan, Iraq and Egypt that President Donald Trump’s decision to pull U.S. troops from Syria is not a sign Washington is retreating from the fight against the Islamic State group. The trip came as a U.S. military official announced Friday that the withdrawal had begun, though he declined to comment on specific timetables or movements. KINSHASA, Congo (AP) — Congo runner-up Martin Fayulu announced on Friday he will file a court challenge to the presidential election results, while his opposition coalition asserted he actually received 61 percent of the vote according to the findings of the influential Catholic Church’s observers. A heavy police presence was on hand. A businessman and vocal campaigner against Congo’s widespread corruption, Fayulu accuses outgoing President Joseph Kabila of making a backroom deal with the surprise declared winner, largely untested opposition leader Felix Tshisekedi. The Catholic Church, the rare authority that many Congolese find trustworthy, has said its 40,000 election observers in all polling stations found a different winner from the official results but it has not given details. Diplomats briefed on the findings say they found Fayulu won easily. Congolese face the extraordinary situation of an election allegedly rigged in favor of the opposition after Kabila’s preferred candidate, Shadary, did poorly in the polls. The electoral commission early Thursday announced that Tshisekedi had won with 38 percent of the vote while Fayulu received 34 percent. This could be Congo’s first peaceful, democratic transfer of power since independence in 1960, but observers have warned that a court challenge could spin the long-troubled country into chaos. Some Fayulu supporters have worried that the constitutional court could invalidate the results, keeping Kabila in power until a new election. There are two options, electoral commission president Corneille Nangaa told the U.N. Security Council on Friday: The official results are accepted or the vote is annulled. Congo’s 80 million people have been largely calm, though police said three people were killed in Kikwit city on Thursday as people protested the results. Some students protested in the city of Mbandaka on Friday. Internet service in Congo, cut off the day after the Dec. 30 vote, has not yet been restored. Some observers wondered whether the international community would be content with any change of power after pressuring Kabila over two years of election delays. “Imperfect elections which guarantee post-election stability are getting more accepted than credible elections that result in refusal of power transfer and conflict!” Arnold Tsunga, Africa director with the International Commission of Jurists rights group, mused on Twitter. Tshisekedi had not been widely considered the leading candidate. Long in the shadow of his father, the late opposition leader Etienne Tshisekedi, he startled Congo last year by breaking away from the opposition’s unity candidate, Fayulu, to stand on his own. Fayulu, a former Exxon manager and Kinshasa lawmaker, was a vocal activist during the turbulent delay in Congo’s election, insisting it was time for Kabila to go as many feared the president would find a way to stay in office and protect his vast assets obtained from Congo’s staggering mineral wealth. Fayulu was backed by two popular opposition leaders barred by the government from running. The difference between Tshisekedi and Fayulu in official results was some 684,000 votes. Some observers said the 1 million voters who were barred at the last minute, with the electoral commission blaming a deadly Ebola virus outbreak, could have made the difference. Elsewhere, election observers reported numerous problems including malfunctioning voting machines and polling stations that opened hours late. Several Congo analysts said it appeared Kabila made a quiet agreement with Tshisekedi, saying Fayulu would have posed more of a threat to his interests and allies and that Tshisekedi was more malleable. Tshisekedi took over as head of Congo’s most prominent opposition party only in early 2018, a year after his father’s death. After results were announced, Tshisekedi said Kabila would be an “important partner” in the power transition. “Felix betrayed the people by licking Kabila’s plate,” said Joel Ituka Kuzembe, 25, who said he spent nine months in prison for participating in the protests that demanded that Kabila step down. Kabila has ruled since 2001 in the Central African nation rich in the minerals key to smartphones around the world. He is barred from serving three consecutive terms but has hinted that he could run again in 2023. Associated Press writer Saleh Mwanamilongo in Kinshasa contributed. Disclosure statement: Reuben Loffman receives funding from the Arts and Humanities Research Council, the Economic and Social Research Council and the British Academy. He is affiliated with the Labour Party. Partners: Queen Mary University of London provides funding as a member of The Conversation UK. Félix Tshisekedi is the Democratic Republic of the Congo’s (DRC) president elect. He is the leader of one of the DRC’s longest serving opposition parties, the Union for Democracy and Social Progress. Before the election, he joined forces with Vital Kamerhe and his Coalition for Change. Tshisekedi promised to make Kamerhe his prime minister if he was elected president. The Coalition for Change faced many political opponents at the polls. Their most formidable was the Common Front for the Congo, led by Emmanuel Shadary. Shadary was outgoing President Joseph Kabila’s favoured candidate. Given that Kabila was reluctant to leave office after the Constitution required that he do so, many believed he would ensure that Shadary was elected. However, Shadary performed badly in the presidential election: he won only 4.4 million votes out of 46 million registered voters coming a distant third to the opposition candidates. Tshisekedi garnered just over seven million votes. On the face of it, this looks like a dream win for the DRC’s opposition parties, who have finally unseated Kabila and defeated his preferred candidate. But with doubts being expressed by runner-up Martin Fayulu, the Catholic church, and the French, it might not be such an easy road to power for the president elect. The French government is among those casting doubt on the credibility of the election results. Fayulu has also openly disputed the results, calling the poll an “electoral coup”. There is also a rapidly developing story that the diploma in Marketing and Communications Tshisekedi may have submitted as a condition of his candidacy might not have existed. Tshisekedi supposedly got the qualification from the Institute of Commercial Careers in Brussels. The institute has refuted his claim. Tshisekedi’s Union for Democracy and Social Progress has also denied submitting the diploma as part of Tshisekedi’s candidature application. Tshisekedi’s academic qualifications are important because the DRC’s electoral commission requires that every presidential candidate must have either a postgraduate diploma, or at least five years’ experience in politics, administration, or socio-economy. His party knows how important the qualification issue is. That’s why the organisation’s Belgian representative André Kabanda has defended Tshisekedi, saying the president-in-waiting has the requisite five years’ experience. He says that Tshisekedi provided a certificate of service in lieu of a postgraduate diploma. This means it was his experience which led to his candidature being ratified by the electoral commission. Even if this storm blows over, Tshisekedi’s credentials will remain under heavy scrutiny and this may make his already mammoth task of uniting the fractious DRC behind him even harder. Even as Tshisekedi and his supporters celebrate their victory, Fayulu was arguably the most important candidate in these elections. He will have a lot of influence in determining what happens next. In the run up to the elections Fayulu was the voice of other major opposition figures – among them former vice-president Jean-Pierre Bemba and former provincial governor Moise Katumbi – when the electoral commission barred them from running. For a long time, Fayulu was ahead in the opinion polls in front of both Shadary and Tshisekedi. But perhaps most importantly he had the support of the Episcopal Centre of the Congolese Catholic Church, which believes he was the rightful winner of the December 30 election. The centre monitored the elections and has since announced that its tally differs from the official results as released by the election commission. There were other organisations monitoring the elections, such as the Southern African Development Community, but it isn’t clear yet if they agree or disagree with the electoral commission’s provisional election results. However, given the power the Church has in the Congo their questioning of the official result could boost Fayulu’s challenge to a Tshisekedi presidency. Fayulu has suggested that this was not a straightforward victory for Tshisekedi, and that the Coalition for Change struck a deal with the Common Front for Congo, which is led by Shadary. Fayulu has implied that the front knew Shadary was unlikely to win and so decided to promote Tshisekedi instead. He has suggested that the front may have thrown its weight behind Tshisekedi and pushed him to victory. While Tshisekedi’s camp has acknowledged that he met with Kabila on several occasions, it has said these meetings were convened to ensure a smooth transition of power rather than to strike a pre-election deal. Tshisekedi’s pick for prime minister, Kamerhe, has affirmed this. However, Kamerhe and Tshisekedi’s assertions have been dismissed by Fayulu who has urged the Catholic Church to publish its results as soon as possible. The church’s results suggest that Fayulu was elected president, and this means that there could be a great deal of unrest in the days to come. VATICAN CITY (AP) — Pope Francis has gone on a road trip to an ancient monastery in central Italy that houses a community of cloistered nuns. The Poor Clares monastery in the Umbria region town of Spello dates from the 14th century. Its nuns belong to an order founded by St. Clare, a follower of the pope’s namesake, St. Francis of Assisi. The Vatican said a car took Francis on the two-hour drive to and from the monastery Friday so he could encourage the nuns in their contemplative life. It said Francis celebrated Mass for the nuns and had lunch with them. Francis frequently slips out of the Vatican on Fridays to meet poor or sick people, a tradition he began during his Jubilee of Mercy. However, he usually stays closer to home in Rome.